6/23/2009Share this story on Facebook! Visit Home Green Home on the Commons for all your eco-friendly, college-living needs. No matter how much thought you put into packing for college, you're bound to forget something. But don't worry. Downtown Ithaca boasts a variety of shops and boutiques packed with everything you might need. For example, the Outdoor Store carries a wide selection of winter jackets, backpacks, hiking shoes, and more. Home Green Home takes "organic beyond the kitchen" with beautiful "green" furnishings and accessories for your room. The collection at Contemporary Trends includes modern furnishings from all over the world, as well as lamps, rugs, and housewares you'll love. And there's more. Check out all the shopping downtown! When you’re getting ready for school, paring down a lifetime’s worth of belongings can seem like a mammoth job. Knowing what the Ithaca essentials are will help streamline (and de-stress) your packing process. Whether you’re worried about surviving an Ithaca winter or outfitting your dorm room, here are some things definitely worth squeezing into the car. You don’t have to go into hibernation when the temperatures drop; just come prepared. A good winter coat is a staple for IC students. You need something that will keep you warm and dry. But not every day will be cold, so fleece jackets are a popular seller at the Outdoor Store on the Commons. “Layering is really the key,” says Outdoor Store employee Scout McCormick. A fleece is great for fall, winter, and spring days when it’s not cold enough to warrant a parka but a sweatshirt just won’t cut it. It’s also great for layering under a winter coat when temperatures dip. Also consider buying thermals for the coldest days: yes, many Ithaca students do wear long underwear. 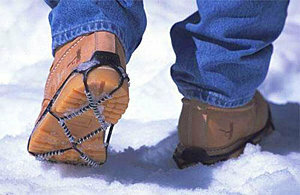 Traction cleats make negotiating ice and snow easier. Fashion-conscious students might consider skipping the UGG boots (which are more like slippers than snow boots.) Chris Pelchat, faculty adviser to the Outdoor Adventure learning community, recommends traction cleats -- small nets with springs that fit on the soles of shoes -- to avoid slipping on ice when walking to class. When you get inside, slip off the cleats and throw them in your bag. Waterproof winter boots and warm socks are other weapons in your arsenal against the elements. Rain, hail, sleet, snow, wet feet. Need we say more? Hats and gloves will also keep you comfortable in-between classes. It may sound like first-grade bus-stop advice, but you’ll thank us later. A microfridges, a small microwave on top of a mini-fridge, is easy to rent and is approved by the school to keep in your dorm room. You and your roommate can sign up for one at the beginning of the year, split the cost, and have it picked up at the end of the school year. Keep snacks and drinks inside so you won’t have to venture far if you need a quick bite. In addition, all residence halls have a kitchen with a microwave. Cases of water bottles are heavy, bulky, expensive, and bad for the environment. Bring a water bottle and a water filter instead. Ithaca water tastes great right from the tap, but if you’re a purist, a filter is a great solution. Just fill it up with tap water and keep it in your mini-fridge. You could brush your teeth in your old gym shorts and stained Hanson tee, but you’ll probably want something more presentable to floss in during peak bathroom hours, so bring a bathroom and actual pajamas. Flip flops for the shower and to and from the bathroom are also useful. You might also want to bring a few items to spruce up your dorm room. Remember, in a small space, less really is more. Bring stuff you love to make it feel welcoming, but don’t bring your entire seashell collection or that learn-to-paint kit you’ve been meaning to open but haven’t gotten to in seven years. Some good ideas include pictures of friends and family to spread around and make your room feel homey, or a few posters to personalize your space and soften the white walls. Lamps are also a good idea. Overhead lights can give your room an institutional feel. Bring some light into the place! An alarm clock is very important. Make sure that it will actually wake you up, not let you hit snooze 10 times and eventually deactivate itself, allowing you to blissfully sleep through your 9:00 a.m. exam. A laundry basket or hamper is the best way to keep your dirty clothing pile from going rogue and taking over your room. Your roommate will appreciate it. 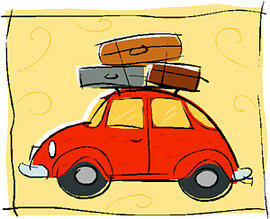 Most importantly, don’t stress out too much about packing. Bring the stuff you know you want and buy the necessities as they come up.